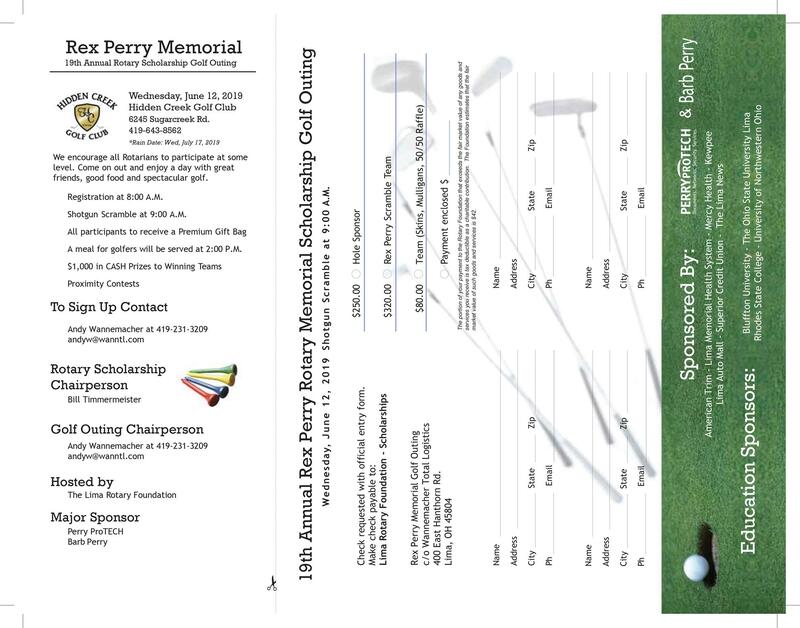 Join us for the Rex Perry Memorial Golf Outing on June 12 and help support the Lima Rotary Club's scholarship fund. 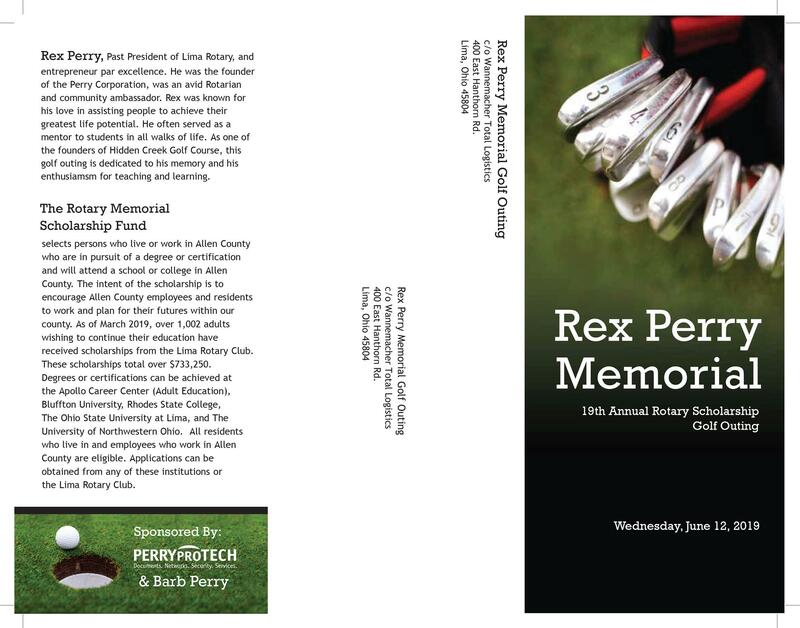 This year’s Rex Perry Memorial Golf Outing will be held on Wednesday, June 12th at Hidden Creek Golf Course in Bluffton, Ohio. The outing begins with a shotgun start at 9:00am and finishes with a delicious luncheon where the team winners will be announced along with the winners of our many fabulous door prizes and the big winner of 50/50 drawing! This year’s cramble will also include a number of exciting games that will be incorporated into the outing to make the day even more exciting and competitive. Last year we had 22 teams competing and are hoping to add a few more as well as crushing last year’s total of $40,000, all of which went to benefit the Rotary Foundation Scholarship Fund. The Rotary Memorial Scholarship Fund selects persons who live or work in Allen County who are in pursuit of a degree or certification and will attend a school or college in Allen County. The intent of the scholarship is to encourage Allen County employees and residents to work and plan for their futures within our county. As of March 2019, over 1,002 adults wishing to continue their education have received scholarships from the Lima Rotary Club. These scholarships total over $733,250. Degrees or certifications can be achieved at the Apollo Career Center (Adult Education), Bluffton University, Rhodes State College, The Ohio State University at Lima and the University of Northwestern Ohio. All residents who live in and employees who work in Allen County are eligible.